Canada's largest airline is suspending its financial guidance for this year following the decision by regulators in Canada and the United States to ground the Boeing 737 Max aircraft until further notice. 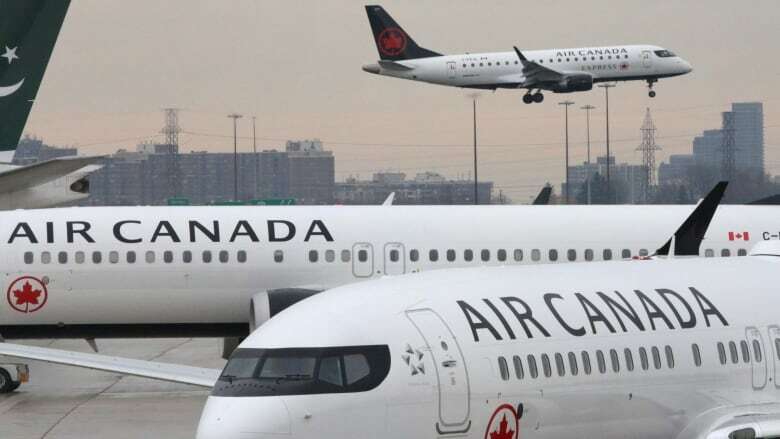 Canada's largest airline suspended its 2019 financial guidance after regulators in Canada and the United States closed their skies to the Boeing 737 Max 8 aircraft over safety concerns. Air Canada said Friday that "in light of the current uncertainty" it is freezing the sunny forecast it released last month for the 2019 financial year, though its healthy predictions for 2020 and 2021 remain in place. Analyst David Ocampo of Cormark Securities said the Max 8 ban will be "a significant hit" in the near term, "and they don't necessarily know how long this ban will last." Max 8 aircraft, which aviation authorities across the globe grounded in the wake of the deadly Ethiopian Airlines crash Sunday, make up about 10 per cent — 24 airplanes — of the main 243-plane fleet operated by Air Canada and its low-cost offshoot, Rouge. The Montreal-based airline can delay retirement or scheduled maintenance for some planes, but older aircraft such as the Airbus A320 are not as fuel efficient and others can only avoid maintenance for so long before heading back to the hangar, further reducing capacity. On Friday, Air Canada reassured investors that its guidance for the years 2020 and 2021 for margin on earnings before interest, taxes, depreciation and amortization (EBITDA) and return on invested capital, as well as the cumulative free cash flow over the 2019-2021 period, remains in place. The airline predicted on Feb. 28 annual EBITDA margins of between 19 per cent and 22 per cent through 2021, topping the street consensus of 17.5 per cent, according to analyst Doug Taylor of Canaccord Genuity Corp.
Air Canada had also said it expected cumulative free cash flow of between $4 billion and $4.5 billion from 2019 until 2021, beating the previous guidance of between $2 billion and $3 billion. Analyst Walter Spracklin of RBC Dominion Securities advised investors not to be alarmed. "We believe the company has avenues to work around the grounding, including the longer in-service use of older aircraft, possible access to third-party aircraft, the temporary use of different gauge aircraft and if necessary the temporary suspension of some routes," he said in a research note Friday. Spracklin said the airline's move "does not come as unexpected and, more importantly, we do not consider it to be impacting our longer-term view on the shares." Regulators around the world grounded the Boeing 737 Max 8 and Max 9 aircraft over safety concerns arising from the crash of Ethiopian Airlines Flight 302 that killed 157 people, including 18 Canadians. The Federal Aviation Authority has mandated Boeing Co. to update by April the software on the more than 375 Max 8s now out of commission around the world, a cost that will likely fall on the plane maker, Ocampo said. An Air Canada spokeswoman wrote in an email it is "too soon to say" how much the software update might cost either company. This is not the first time Boeing has faced a ban. In 2013, regulators worldwide grounded its 787 Dreamliners due to safety concerns around the jetliner's lithium-ion batteries. The company paid airlines an undisclosed amount as a result. "They do pay for delays with delivering aircraft, so I imagine that there is some sort of offset with the grounding of the fleet," Ocampo said, regarding possible compensation for the Max 8 ban. Air Canada and WestJet Airlines Ltd. have declined to reveal those service agreement details to analysts, he said. Collectively, the airlines cancelled more than two-dozen flights Thursday, affecting roughly 12,000 spring-break passengers as they scrambled to rearrange flight schedules over the next three weeks.